Missing teeth can often affect not only your appearance but also your quality of life and ability to do everyday tasks. However, you do not have to give up on your favourite food or restraint from speaking/singing freely just because you have missing teeth. Specialist Dental Group uses the latest technology to create dental implants that look, feel and function like natural teeth. Whether it is a result of extensive cavities, severe injury, an unfortunate accident, or periodontal (gum) disease, our dental specialists would provide an accurate consultation on whether this is a suitable treatment option for you. Generally, a healing period of three months is needed before the final crown is seated. Made using zirconia, a very strong and translucent material, these crowns are indistinguishable from the rest of your teeth in all but the most careful inspections. 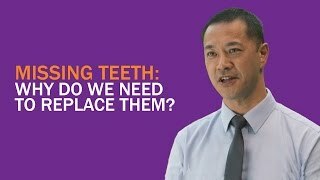 Looking for a less permanent option to replace missing teeth? Have a discussion with us today about how dentures can help to improve your performance of daily activities such as chewing, eating and speaking. Specialist Dental Group has been solving our patients’ dental needs since 1979. Over the years, we have been awarded with various awards to recognise the superior healthcare experience we provide to our patients. Bring out your best smile. Contact us at (65) 6734 9393 (Mount Elizabeth Orchard) or (65) 6471 5150 (Gleneagles Medical Centre). If you require any assistance, feel free to fill in the enquiry form and we’ll get back to you as soon as possible. Dental implants are a permanent solution for one or multiple missing teeth. They look, feel and function just like your natural teeth. Our dental specialists/ dentists will find out the details of your medical and dental history, go through a consultation and examination, and take an x-ray of your teeth and jaws, to ascertain if you are suitable for dental implants.Thereafter our dentists will discuss with you to recommend the most appropriate solution for your needs. A titanium screw – the dental implant, is placed into your jaw bone to replace the root of the missing tooth. The implant serves as an anchor for your new tooth/ teeth. Temporary replacement teeth will be fabricated and fitted on the same day as your implant placement so that you do not leave our clinic without teeth. 2 to 6 months later, once the bond is formed between the implant(s) and your bone (osseointegration), new permanent teeth (implant crowns) can be firmly attached to the implant(s). Our dental specialists/ dentists will make an impression of your teeth and fabricate the replacement teeth (dental crowns) that will be attached to the dental implants. Once completed, your new teeth will look, feel and function just like your natural teeth. Dental implants require the same maintenance as your natural teeth – flossing, brushing and regular dental check-ups. Periodic follow-up visits will be scheduled to monitor the dental implants, teeth and gums to make sure that everything is in tip top condition. **All fees are subject to 7% Singapore Goods and Services Tax. It may be possible to have a reduction in the fee if multiple teeth are involved. All fees above include both the surgical component (implant placement) and prosthetic components (implant crowns). If you are a Singaporean or a permanent resident of Singapore, Medisave may be utilized for the surgical component of dental implant treatment. Learn How You Can Restore Your Teeth and Brighten Your Smile! Need a comprehensive guide on everything related to dental implants? Will I experience any pain or side effects? How do I choose the right dental implants? Should I go for dentures, bridge and crown, or implants? Who are the Dental Specialists/Dentists? Specialist Dental Group’s Dental Implant team comprises of internationally qualified dental specialists/ dentists from the specialty areas of prosthodontics(teeth replacement and cosmetic dentistry), periodontics(gum treatment) and oral & maxillofacial surgery(reconstructive dentistry). We can usually schedule for you to see our dental specialists/ dentists within 24 hours and depending on your dental condition, it may be possible for you to start dental implant treatment on the same day as your initial consultation. This procedure most suitable for patients with a single or multiple missing teeth. On the day of the surgery where the implant(s) is inserted, temporary crown(s) will also be fabricated and attached. Once the implant has integrated with your jaw bone, new permanent teeth (dental crowns) will be fitted. This procedure enables those who are missing a full jaw of teeth (fully edentulous) to have their teeth replaced on the same day, using only 4 implants to support the full set of prosthesis (fixed bridge permanent teeth). This is also suitable for individuals with less bone on their upper jaw, as the dental implants are placed at an angled position to optimize the available space on the upper jaw, increasing bone-to-implant contact and reducing the need for bone grafting. How do I clean/maintain my dental implants? What should I do after my implant surgery? When is bone augmentation or bone graft surgery required? What is the downtime for the procedure? Do implant procedures hurt? What is the downtime for the procedure?